Published by the Pennsylvania Freedmen's Relief Association, this broadside is illustrated with a picture of "Sea-island School, No 1--St. Helena Island [South Carolina], Established April, 1862." May 1863 letters from teachers at St. Helena Island describe their young students as "the prettiest little things you ever saw, with solemn little faces, and eyes like stars." Vacations seemed a hardship to these students, who were so anxious to improve their reading and writing that they begged not to "be punished so again." 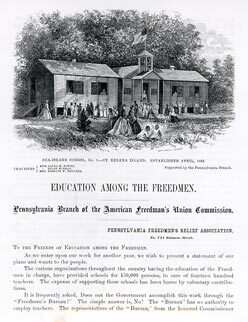 Voluntary contributions from various organizations aided fourteen hundred teachers in providing literacy and vocational education for 150,000 freedmen.